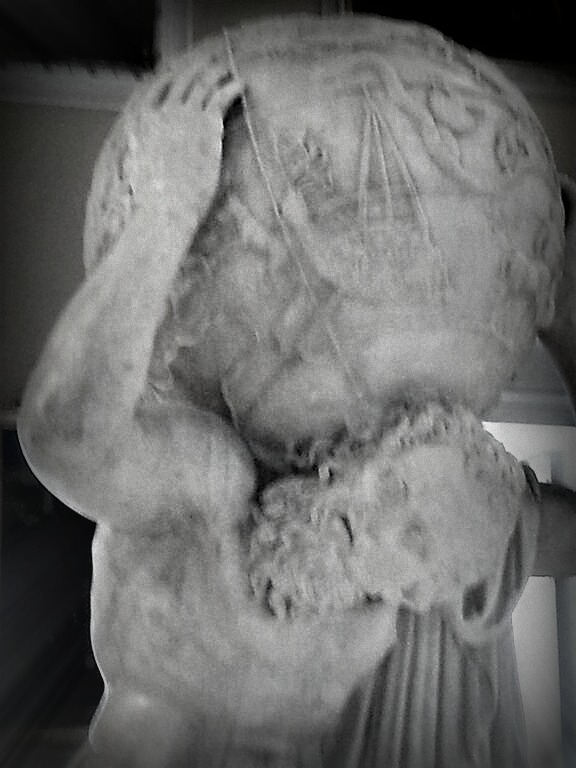 Sculpture of Atlas, blurry photo taken by yours truly at the Museo Archeologico Nazionale di Napoli. I would never get my mom Life Alert. For one thing, she probably wouldn’t wear it. For another thing, if she ever fell down and broke her hip, I am confident that she would hoist herself up and hobble over to the kitchen to complete the crossword puzzle. What’s a three-letter word for “stubborn”? You just can’t keep a good woman down. Trust me. I’ve tried. Ye gods, how I’ve tried. The last day of our beach vacation, Mom, while boogieboarding, fell in the sand and was twisted around by a vicious wave, knocking her knee out of place. This means that ever since we’ve been back, the numbers on my vivofit (the Garmin version of a fitbit) have been spinning wildly as I chase Mom down with an ice pack, begging her to sit down for a few minutes. Let me tell you, convincing my mother to relax is exhausting. The closest thing to a crutch we’ve been able to get her to use is the vacuum cleaner. Even Hercules, who reportedly possessed an impressive amount of both brawn and brain, which he used to trick, tame, or kill the most intelligent and fearsome creatures ancient storytellers could invent, wouldn’t be able to pin down my mom, despite her twisted knee and dislocated rotator cuff. Not that I meant to compare Mom to a legendary monster. Although I do think that she resembles a mythological being who was tricked by Hercules: Atlas. I suppose there’s something inside a mother that calls for her to stand on twisted knees and hoist our world on an aching back. They uphold the cosmos with their inexhaustible strength. They keep our celestial spheres spinning with their tremendous energy – mostly in the form of boundless worry and love. Of course, even Atlas – the “Titan of Strength” – got a short break while Hercules shouldered the universe for him. And if this metaphor makes me a demigoddess, then I accept that.